FILE - Members of the Taliban celebrate the cease-fire in Ghanikhel district of Nangarhar province, Afghanistan, June 16, 2018. Pakistan played a key role in the June cease-fire Afghanistan made with the Taliban designed to allow the country to celebrate the holy festival of Eid peacefully, Afghanistan’s ambassador to Islamabad said Thursday. “The recent cease-fire ... I should acknowledge that Pakistan did have a role to play in that. We are grateful for that,” said Hazrat Omar Zakhilwal, during a daylong conference organized by Islamabad based think tank the Jinnah Institute. He also thanked Pakistan in advance for what he said would be the country’s role if the cease-fire became permanent. This move bodes well for relations between Pakistan and Afghanistan, which have been rocky for almost two years. “The high-level visits from both countries significantly reduced negative rhetoric against each other, significantly reduced incidents or irritants between the two countries, and (we have seen) a more robust cooperation from Pakistan with respect to peace and stability,” Zakhilwal said. 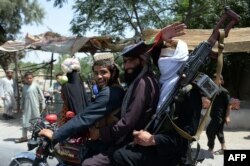 FILE - Afghan Taliban militants ride a motorbike as they took to the street to celebrate the cease-fire on the second day of Eid in the outskirts of Jalalabad, June 16, 2018. When the cease-fire was announced, scores of Taliban fighters headed to the cities, several of them posted selfies with the local population. Others offered Eid prayers with members of the security forces — their battlefield enemies. Several of them told the media they were tired of the war. But the temporary cease-fire, termed a crucial step for any reconciliation process to succeed in Afghanistan, failed to begin a new phase of talks among key stakeholders in the region, with the Taliban rejecting an extension proposed by Afghanistan President Ashraf Ghani. According to Ambassador Zakhilwar, the leadership refused to extend the cease-fire out of fear it might lead to an end of war without a negotiation. “Certainly for the leaders, after fighting for so many years, at a minimum, they want to get something out of it,” he said. Afghan President Ashraf Ghani speaks during a news conference in Kabul, Afghanistan, June 30, 2018. However, Khalilullah Safi, a peace activist who has worked on the peace process for a long time and has contacts with both sides, alleged that one of the reasons the Taliban did not extend the cease-fire was the Ghani administration failed to deliver on commitments it made to them. “During Ramadan, the Afghan government gathered Muslim clerics to issue a fatwa (edict) against the Taliban, which angered the Taliban,” Safi said. He said both sides had also agreed to release certain prisoners and the Afghan government failed to do so. “Taliban said the Afghan government did not keep its commitment, which is why they did not extend the cease-fire,” Safi said. Zakhilwal also claims the cease-fire was not extended because the Taliban leadership got scared when they saw the reaction from their own fighters. “The cease-fire showed … that their fighters were indeed tired of the ongoing war, indeed were open for peace talks, indeed were thirsty for peaceful days,” he said, adding that it dealt a blow to the Taliban leadership’s narrative that any signs of negotiations will lead to resistance or even rebellion in their own ranks. But Taliban leaders say the cease-fire proved they were a unified force and claims of ruptures within its ranks are baseless.